Track Town is Title Town. Fueled by three individual national champions Saturday, the Oregon men won their first team title at the NCAA Outdoor Track & Field Championships since 1984. The Ducks needed 24 points entering the day to secure an outdoor title, after winning the NCAA Indoor title earlier this year, and got all that and more with wins from Mac Fleet in the 1,500 meters, Sam Crouser in the javelin and Devon Allenin the 110 hurdles. Tanguy Pepiot (steeplechase) and Arthur Delaney(200) also scored for the UO men, who put up a meet-record 88 points. Florida was second with 70, after collecting three event titles of its own Saturday at Hayward Field. Oregon's margin of victory was the largest at the meet since 1994. "If you would have told me at the beginning of the year that 70 points would not have won the NCAA championship, I would have been like, you're crazy," UO coach Robert Johnson said. The three individual champions followed Edward Cheserek's win in the 10,000 meters Wednesday. In between the Ducks augmented their score with points elsewhere, including a 2-3-4 finish in the 5,000 on Friday that embodied the team's "Strength in Numbers" mantra. "It's a really special group of guys, a really close team," Fleet said. "To show up and be able to compete well, it's incredible." Fleet avenged Cheserek's loss to Arizona's Lawi Lalang in the 5k by outkicking Lalang Saturday, giving the UO senior his second straight 1,500 national title. Crouser came through with the winning javelin throw on his final attempt of the competition, within minutes of Allen — a redshirt freshman receiver whose first priority remains football — shocking the 11,344 in attendance with his championship run in the hurdles. Allen's race wrapped up the team title for Oregon, a good thing since the Ducks' 4x400 team — on which Allen competed — committed a lane violation in the semifinals and didn't compete in the finals. "Our men's team really showed up this week," Fleet said. "Eighty-eight points, with an ugly DQ in the 4x4, it's awesome." While the wins from Fleet and Crouser were not unexpected, Allen's victory left even Johnson "shocked," the coach acknowledged. In the middle of the pack early in the race, Allen powered over the final hurdle and through his final few strides to win in 13.16 seconds. That wasn't just a personal best and UO record, it was the second-fastest time ever run by a collegian. Allen became the first freshman to win the 110 hurdles title since 1976. "As the year progressed, I felt like I could go for it," said Allen, who split time between track and football during the football team's spring practices throughout April. "And that's what I did today. With the fans behind me and everything like that, I'm just happy. I'm really excited and proud to be a Duck." Allen, described by Johnson as "a super-competitor," bested Aleec Harris of USC by just two-hundredths of a second. But he confidently raised his arms in jubilation even before final times popped up on the stadium scoreboard. "I told my friends if I won I wouldn't show any emotion, but I couldn't — I had to," said Allen, who scored two touchdowns in the football team's spring game and is expected to contend for a starting job in the fall. "I was really excited to win, and score some points for my team." By the time the gun went off in the 110 hurdles, the Ducks simply needed Allen to avoid a false start and then successfully navigate the hurdles. Even a last-place finish would have given Oregon the one point it needed to secure the team title. Crouser's win put the UO men in that position. He led the javelin competition after the end of the first flight with a throw of 243-11, fell behind Kentucky's Raymond Dykstra entering the sixth round and then uncorked the winning throw of 252-7. "You just have to go after it and attack, use that homefield crowd to your advantage," Crouser said. "And that's what happened. It's just a dream come true, to be honest. I couldn't be happier." Crouser's father, Dean, was a three-time NCAA champion as a UO thrower, and his uncle Brian was both a two-time NCAA champion in the javelin and a member of the last UO men's team to win the NCAA team title, in 1984. His cousin, Ryan, won the shot put title for Texas on Wednesday. That was also the day Cheserek won the 10k, helping the Ducks get the ball rolling to their impressive team title this week. "Ed and guys like that have just given us such a relaxed (feeling)," Crouser said. "We're up by quite a few points, so I just had to come in and do my thing." Fleet became the first man to repeat as NCAA champ in the 1,500 since 1997-98, edging Lalang at the line to win in 3:39.09. Fleet typically prefers to run off the lead and finish strong. He ran second behind Lalang most of the race, but was comfortable enough with the pace to stay near the front. "When we came through 80 and it was what it was (1:58), I was pretty excited," Fleet said. "My chances, I thought, got better." Just as Lalang took advantage of Cheserek's having won the 10k earlier in the meet to outkick him in the 5,000 on Friday, Fleet had the better kick in the 1,500 one day later. "I got maybe half a stride and had a little misstep," Fleet said. "I could see Lawi's hands (just to my left) the entire way through — he's got that big arm swing — so I knew he was there the entire time. … Big lean, big twist at the end — awesome feeling." Fleet said wrapping up his career with consecutive titles made him "feel like this is exactly how the story was supposed to go." While Fleet was writing the final chapter to his career, freshman Sam Prakel is in the early stages. He was something of a surprise qualifier for the 1,500 final, and ran a PR of 3:41.04 to finish 10th on Saturday. "This whole weekend is going to benefit me in the future," Prakel said. "Given experience in a race like that, and it was my PR … just being in that race was an honor." It was a similar story for Arthur Delaney, a surprise qualifier for the 200 final. Motivated to make up for his lane violation that resulted in the 4x400 team being disqualified, Delaney gave the Ducks two points with a seventh-place finish in the 200. "It'll be there next year," said Delaney, who was victimized by a poor start in the final. "This was my first national championships individually, so it's a good learning experience." The team title made Oregon one of just two schools ever to win three of the four indoor and outdoor team titles in the same year. That's an impressive update to Johnson's resume, though the full weight of the accomplishment hadn't quite hit him yet Saturday, he said. "For us to be able to win a national championship, one of the few in 30-something years, that's pretty special, probably one of the highlights of my career. I guess I balance that with, I'm just one of the shepherds of the prorgam. Sooner or later my time will run out, and somebody else will come in and shepherd the program to hopefully continue the legacy we have here." For now, though, it's Johnson who gets to celebrate bringing another title back to Track Town. EUGENE, Ore. (AP) — Oregon senior Mac Fleet leaned at the finish line in the 1,500 meters, just to ensure he defended his NCAA title. Arizona's Lawi Lalang was right on his heels. "I could see Lawi's hands right here — he's got that big arm swing — all the way to the end," Fleet said, gesturing over his shoulder. Fleet's victory Saturday at the NCAA track and field championships denied Lalang a ninth national title in his final college race. Fleet pulled ahead down the stretch and bore down for the final 50 meters to win in a personal-best 3 minutes, 39.09 seconds, with Lalang close behind in 3:39.13 to the delight of the Ducks' home crowd at Hayward Field. "Big lean at the end," Fleet said. "I wanted to make sure." Fleet's victory helped push the Oregon men (88 points) to the team's first outdoor national title since 1984. Texas A&M (75 points) won the women's title. Fleet became the first man to repeat in the 1,500 since Seneca Lassiter of Arkansas in 1997 and 1998. On Friday night, Lalang won the 5,000 in a meet-record 13:18.36 for his eighth NCAA title. Oregon freshman Edward Cheserek took the lead on the final lap, but defending champion Lalang pulled back in front on the final 100 meters for the dramatic finish. Lalang was vying to become the first man to win both the 1,500 and the 5K in the same year. "I've done my best. I have nothing to regret," Lalang said about his impressive college career. "I'm really happy." Arizona State junior Shelby Houlihan won the women's 1,500 in 4:18.10. The Ducks went into the meet ranked No. 1 in the nation by the U.S. Track & Field and Cross Country Coaches Association. Oregon, which has won eight straight Pac-12 titles, also claimed the NCAA indoor championship this year. Second-ranked Florida finished second in the men's standings with 70 points. The Gators and Texas A&M were the co-champions last year, when the outdoor championships were also held at Hayward Field. The Texas women were the runners-up to the Aggies with 66 points. Oregon finished third with 59. The Longhorns were ranked No. 1 by the USTFCCCA, followed by the Aggies. The third-ranked Ducks, coming off their sixth straight Pac-12 title, have not won an outdoor team title since 1985. Kansas was the defending champion. Florida's men defended their title in the 400 relay in 38.73 seconds, while Texas A&M defended on the women's side in 42.80. The victory pulled the Aggies into the points lead in the team standings. Texas A&M won the men's 1,600 relay in 2:59.60, while the Texas women won the event in 3:24.21. Florida junior Dedric Dukes won the 200 with in a wind-aided 19.91, while Texas A&M junior Kamaria Brown won the women's 200 in 22.63. Oregon junior Sam Crouser won the javelin with a throw of 252 feet, 7 inches. Shortly thereafter, Ducks freshman Devon Allen won the 110 hurdles in a meet record 13:16, which gave Oregon the points it needed to win the team title. Allen is the first freshman to win the national title in the event since San Jose State's Dedy Cooper in 1976. Allen is also wide receiver on Oregon's football team, following several Ducks in recent years who have doubled up in the two sports. "I had a good day today," Allen said. "But it's still football first." Oregon coach Robert Johnson said the Ducks men finished off the meet in style. "In an amount of about an hour we had three national champions with Crouser, Fleet, and Allen. Devon (Allen) is a super competitor and Crouser there on his last throw has a flair for the dramatic," Johnson said. "Then, of course the golden boy Mac Fleet did an awesome job there just biding his time." Other winners Saturday included UTEP junior Anthony Rotich, who won the men's steeplechase in 8:32.21; Arkansas State senior Sharika Nelvis, who won the women's 100 hurdles in a wind-aided 12.52; and Texas senior Marielle Hall, who won the 5,000 in 15:35.11. In the other field events, Iowa sophomore Christina Hillman won the women's shot put at 58-2; Georgia sophomore Leontia Kallenou won the women's high jump in 6-2 1/4; and Marquis Dendy wont the men's triple jump with a leap of 55-11 1/4. EUGENE, Ore. — What a race! Arizona’s Lawi Lalang outkicked previously-unbeatable Edward Cheserek of Oregon in front of 10,104 screaming Ducks fans at Hayward Field to win the men’s 5,000 meters tonight in a meet-record 13:18.36 at the 2014 NCAA Outdoor Track and Field Championships. Cheserek made his move with 240 meters to go but for the first time in his NCAA championship career, he was unable to break his closest competitor. Lalang hung right with him and, after a thrilling home-stretch battle, Lalang pulled away with 25 meters to go to win the greatest 5,000-meter race in NCAA history.Cheserek, who was coming back from a victory in Wednesday night’s 10,000 settled for second in a big PR of 13:18.71 but he couldn’t be too upset: Oregon went 2-3-4 in the race to claim a massive 19 points in the team race. Lalang has one more track race in a career that’s already brought him eight NCAA titles. He’ll go for number nine in Saturday’s 1500 final. With noted front-runners Lalang and Kennedy Kithuka in the race, a fast pace was expected and Kithuka wasted no time pushing it up front; by 600 meters, the 25 runners were strung out single-file. Kithuka led the field through 800 meters in 2:08 and it was clear early: this one was going to be fast. By the time they hit 1600 in 4:16, there was a lead pack of six: Lalang, Kithuka, Cheserek, Wisconsin’s Mo Ahmed, NC State’s Andrew Colleyand Wednesday’s 10,000 runner-up Shadrack Kipchirchir of Oklahoma State. Lalang, who had taken the lead just before 1600, wanted to ensure the pace remained fast and continued to push, running 64.87 from 1400 to 1800. Colley and Kipchirchir dropped and the lead pack was down to four. At 2200 meters, Kithuka took the lead again, but Lalang, who said after the race he was worried that Kithuka wouldn’t run fast enough, quickly responded, regained the lead and kept pushing. This same act played out several times over the course of the second mile: Kithuka taking the lead and Lalang immediately responding and passing him back. With a mile to go, Lalang finally took the lead for good as Kithuka began to fade. Cheserek and Ahmed remained with Lalang as a second group, led by Stanford’s Joe Rosa and also including Oregon’s Eric Jenkins and Trevor Dunbar and Villanova’s Patrick Tiernan, made inroads on the leaders. Lalang continued to push, running 64.7 and 64.5 laps in the hopes of running the kick out of Cheserek, who closed Wednesday’s 10,000 final in 53 seconds. The pace was too much for the other runners to handle, and with two to go it was down to Lalang, Cheserek and Ahmed. A 63.59 penultimate lap dropped Ahmed. At the bell, only the two NCAA legends, Lalang and Cheserek, remained. Lalang started to press entering the first turn of the final lap, but Cheserek — who had been militant about not letting a gap form to Lalang for the entire race — was hanging tough. With 240 to go, Cheserek took off, just as he had in the 10,000 (only about 10 meters farther down the track). But this time, he’d been running 64s and 63s for the final mile, not 70s and 71s, and he was being chased by a 13:00 guy in Lalang. Lalang stuck on him and on the final turn, the roaring Hayward Field fans witnessed an event heretofore unseen in the collegiate ranks: a competitor was gaining on Cheserek in the last 200 of a race. As they came off the final turn, Lalang, now in lane two, had pulled ever so slightly ahead of Cheserek as Cheserek moved wide to maneuver around a lapped runner on the inside. Lalang and Cheserek sprinted up the homestretch side-by-side, and with 50 to go Cheserek was drifting to the outer edge of lane two and into Lalang. The two made contact as both runners struggled to maintain their form. As they neared the finish line, Lalang made one last bid for the lead, and this time Cheserek could not respond. Lalang had enough room to celebrate over the line, and though the partisan crowd wanted to see an Oregon victory, they applauded both men vociferously for a truly spectacular race. Many had wondered before the race how to defeat the great Cheserek and Lalang revealed the answer: a 4:09 last mile, closing in 56.74 for the final 400. Behind the top two, the merciless pace took its toll on the early leaders. Ahmed faded to fifth and Kithuka to eighth as Ducks Trevor Dunbar and Eric Jenkins ran very smart races to take third and fourth, racking up major team points for Oregon. Ahmed was next, with Tiernan, Rosa and Kithuka rounding out the top eight, all of whom ran 13:34 or faster (five men broke 13:30). Results, quick takes and interviews below. Talk about this amazing race in our messageboard as the fans are going bonkers over it: Wow Wow Wow!! The greatest 5000 in NCAA history. Lawi comes back on Ches!!! NCAA Record. UO goes 2-3-4!!! Quick Take #1: Top two times both under the previous NCAA record. Two lead changes in the final 200. A roaring crowd of 10,000+. The greatest NCAA 5,000 ever. Quick Take #2: Lalang was very excited after this one was over and feels today’s win will inspire him tomorrow. When asked what impact this race would have on the 1500 and whether he’d be too tired to end his NCAA track career on a winning note, Lalang said just the opposite. He thought today’s win would inspire him and motivate him for tomorrow. As for having to overcome that roaring Hayward Field crowd that was supporting Cheserek, Lalang had a simple reply. When he heard the crowd roar, he just make believed they were cheering for him. Cheserek admitted that he was surprised when Lalang came back around him and said it was tough come back from the 10,000 two days ago. Quick Take #4: Stanford’s Joe Rosa was hoping to be top American coming in but was happy with his 13:31 pb and his 2013-14 campaign as a whole. Rosa said his season is now over and the goal is to get ready for cross country where Stanford will face a loaded Oregon team but also the defending Pac 12 champs Colorado. He said coach Chris Miltenberg’s training is working well for him and that the Cardinal believe they have 4 guys who can finish top 10 at NCAAs next year (himself, brother Jim Rosa, Sean McGorty and transfer Maksim Korolev). On an individual day, he said that’s not going to happen but they are focusing on making sure if they have a bad day they don’t fade all the way back to 100. Quick Take #5: Kithuka said that he wanted a fast race but that he didn’t talk to Lalang about making it fast beforehand. Kithuka was upbeat even though he finished just eighth as he executed his race plan and just couldn’t hang on to Lalang and Cheserek when they broke away. Kithuka is out of eligibility and closes out his career with one NCAA XC title and one indoor 5,000 title. He said he’s not done with classes at Texas Tech until August, so he’s going to stay in Lubbock with his coach until then and figure things out. Quick Take #6: Wondering what the most NCAA titles in a career on a men’s side is? 15—Suleiman Nyambui, UTEP (XC 1980, 5,000‑meter run 1980‑81‑82, 10,000‑meter run 1979‑80‑81‑82). 8—Jesse Owens, Ohio St. (100‑yard dash 1935, 100‑meter dash 1936, 220‑yard dash 1935, 200‑meter dash 1936, 220‑yard low hurdles 1935‑36, long jump 1935‑36). Quick Take #7: This race proves to us that for track to be popular, it needs to feature competition not time, and races where the outcome means something. There was a 5000 meters run on this very same track two weeks ago at the Nike Prefontaine Classic. In worse conditions (much hotter), it featured a much faster winning time (13:01) and faster last lap (54.7) but it wasn’t nearly as exciting: Caleb Ndiku Outkicks Alamirew as the Americans Struggle. No doubt about it Lalang’s collegiate career has been way better than Lagat’s. Coach Li talks about Lawi’s win and we ask him to compare Lawi’s career to Bernard’s. 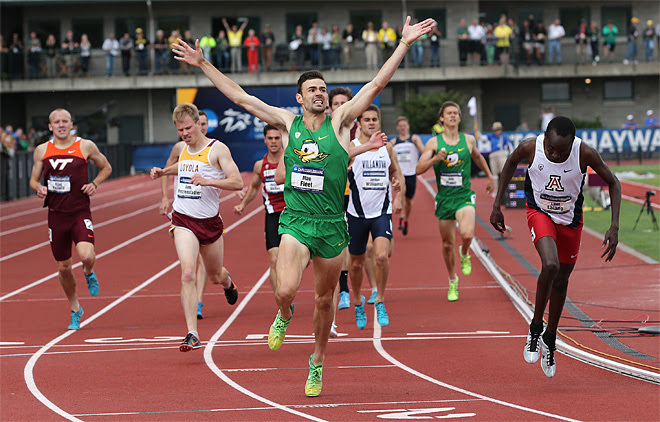 EUGENE, Ore. — Oregon’s Mac Fleet held off Arizona’s eight-time NCAA champion Lawi Lalang in a great home-stretch duel to repeat in the men’s 1500 at the 2014 NCAA Outdoor Track and Field Championships at Hayward Field. Fleet became the first repeat champion since Arkansas’ Seneca Lassiterin 1998, while Lalang, who won last night’s epic 5,000 final, had to settle for second in his final NCAA race. Lalang went straight to the front and after a first lap of 57 seconds, the field was strung out behind him. Fleet got out well and sat on Lalang in second, a position he would hold until the homestretch. The wind picked up on the second lap and the pace slowed, as Lalang hit 800 in 1:57. Fleet was right behind him, with Villanova’s Jordy Williamsz, Minnesota’s John Simon, Oregon’s Sam Prakel and New Mexico’s Peter Callahan in tow. Lalang covered 700 to 1100 in 61.14; as he hit the bell everyone was still in it except Brandon Kidder of Penn State. Lalang really started to push on the first turn of the final lap, and the race was on. On the final turn, Fleet and Lalang started to gap the field with the exception of Callahan, who made a hard move with 250 to go to move up from eighth place. Callahan pulled even with Fleet on the turn but couldn’t pass him. Fleet then started to gain on Lalang and by 75m to go, the two were stride for stride. Fleet then moved slightly ahead of Lalang and though Lalang was clearly straining, he couldn’t manage to pull even with Fleet in front of the raucous Oregon crowd. Fleet would just hold off Lalang, 3:39.09 to 3:39.13, and ended his NCAA career with a repeat title on his home track. He was jubilant afterwards, pointing to the crowd and flashing the Oregon “O” with his hands. Loyola’s Sam Penzenstadlermoved up well to edge Callahan for third. Results and quick takes below.